The blood-soaked confection A Gentleman’s Guide to Love & Murder takes the recipe for an eat-the-rich manifesto and douses it in honey. The show’s many homicide victims are wealthy aristocrats whose upper-crustiness makes it easier for us to root for their killer, the ruthlessly social-climbing Monty Navarro (Andrés Enriquez). In a comedy of murders, it helps if the audience doesn’t feel too much sympathy for the people getting got. Sprouting from a distant branch of the awfully rich and richly awful D’Ysquith family, Monty sets out to eliminate every family member that stands between him and the Earldom of Highurst. Murder comes quite naturally to young Monty—the 1908 setting makes getting away with it a bit easier—but love proves thornier. 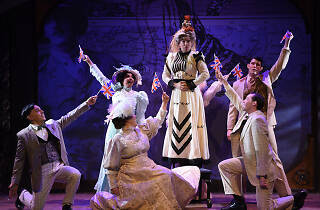 As his spree unfolds, Monty finds himself caught between his tempestuous romance with the married Sibella (Emily Goldberg) and the genteel affection he feels for his distant cousin, Phoebe (Ann Delaney). 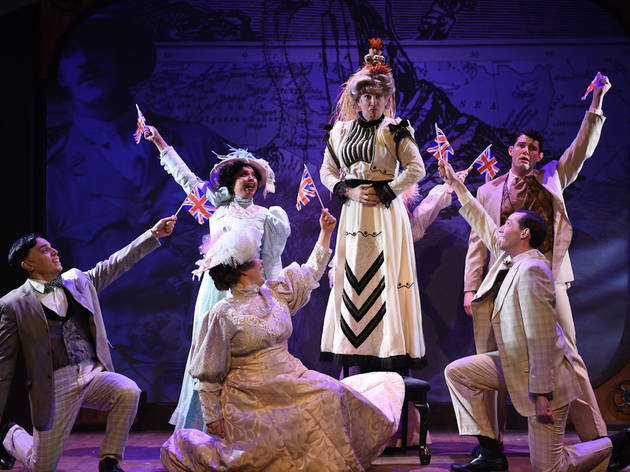 With an archly gothic book by Robert L. Freedman and jaunty, Anglophilic songs by Freedman and composer Stephen Lutvak, the musical skips lightly and politely across the surface of its gruesome tale. In Porchlight Music Theatre’s production, directed to perfection by Stephen Schellhardt, Angie Miller’s set and Anthony Churchill’s projections work together to create a gleefully elegant abattoir. The stage opens and closes like a massive storybook, with the projections serving as the pages; each spread sports a new vista. In keeping with the show’s anarchic spirit, the first D’Ysquith death is punctuated with stunning effect that conjures the world’s most satisfying splat. A Gentleman’s Guide has the same source material as the 1949 film Kind Hearts and Coronets, and borrows as casting conceit from it: Every member of the D’Ysquith family is played by the same actor, Matt Crowle. It’s less a showy role than a whole show unto itself, and Crowle plays it to the hilt, conjuring laughs from thin air on top of the many punchlines gifted him in the script. But the production’s secret weapon is Enriquez’s megawatt smile: a grin that morphs from wide-eyed to maniacal as Monty spills buckets of blood but never loses an ounce of audience sympathy. Forget murder most foul—this is murder most fun. Porchlight Music Theatre. Music by Stephen Lutvak. Lyrics by Robert L. Freedman and Steven Lutvak. Book by Robert L. Freedman. Directed by Stephen Schellhardt. With Matt Crowle, Andrés Enriquez, Emily Goldberg, Ann Delaney. Running time: 2hrs 15mins. One intermission.